On a clear summer morning in 1992 at the Allied Forces South (AFSOUTH) headquarters in Napoli, Italy, a small group of avid cappuccino drinkers gathered at the local cappuccino bar. Once they settled in at their tables, one of them mentioned how on walking to the cappuccino bar that he noticed that the U.S. contingent of intelligence personnel located on the post were once again having their monthly awards ceremony on the quad. It was located in the center of the base, where nearly everyone could witness the event. This small group — mostly composed of enlisted intelligence analysts, officers of the U.S. Army, Air Force, and Navy, and enlisted members from the British and Italian forces — began talking about the awards ceremony. While all realized that typical award ceremonies recognize those individuals for performing above and beyond their expected duties, the opinion of those present did not reflect this outlook. In fact, the conversation quickly took on a negative tone. The discussion focused on how unfair it was for the men and women of the U.S. contingent who were in Napoli for only six-month tours to receive a joint award for doing the exact same mission as their North Atlantic Treaty Organization (NATO) counterparts did for three or more years. It did not take long for one individual to suggest that they should also receive an award for their service. While everyone laughed at that idea because it was not going to occur, there was still a sense of bitterness in the air. One of the participants, a U.S. Army major, took the conversation to heart. Upon the return to her office, the major decided to talk to her superiors about the disgruntlement and a possible solution. In an impromptu discussion with her immediate NATO supervisor, a U.S. Marine Corps Lieutenant Colonel, she broached the topic of a multi-national award. He, in turn, talked to his supervisor, a U.S. Air Force Colonel who then took the suggestion up to his supervisor, a Turkish Brigadier General, and to the commander of the U.S. forces, an Army Brigadier General. Word began to spread throughout the upper echelons of the NATO command structure at AFSOUTH, including the AFSOUTH Commander, an U.S. Admiral. Soon, there was a consensus among the senior officers on the need for the creation of a medal for those members of NATO involved in the first-ever Allied operations occurring in Bosnia-Herzegovina. The concept of the medal, along with a sketch, was sent to the Supreme Headquarters Allied Powers Europe (SHAPE) in Brussels, Belgium. From there, all of NATO’s member countries received a request to consider the medal. In an era where some of these countries had very few medals that their servicemembers could receive, the addition of a combined medal was unique. The majority of NATO nations only had medals for service to their own country, but the United Nations had already set the precedent for an international award for participation in joint international operations. 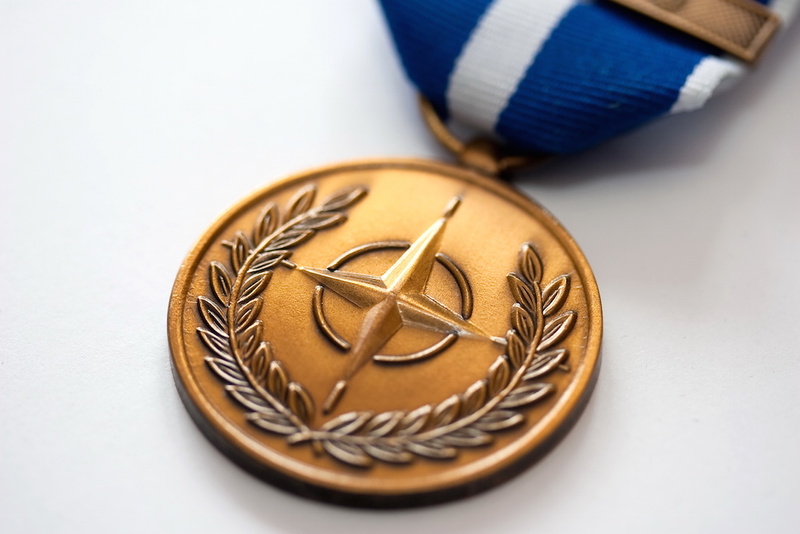 Within a relatively short time — considering the need for all 16 nations to consider the merits of a new award and approve it at their country’s level — the NATO Medal came into being on 20 December 20, 1994, when the North Atlantic Council agreed to the establishment of the medal. It was six days after the Dayton Accords established a peace agreement for Bosnia and Herzegovina. By this time, AFSOUTH had already deployed troops into Zagreb, Croatia, and the first NATO troops would enter Sarajevo prior to the New Year. Within a short time, word of the NATO Medal trickled down through the vast NATO command structure to men and women of AFSOUTH, as well as through the national commands of the member nations. The timing was perfect as the members of AFSOUTH and the American contingent were now actively working together in the first-ever deployment of NATO forces. Since then, an unknown number of servicemembers from NATO countries have earned the award. While the design of the medallion itself has remained the same, the ribbon and clasp have evolved as NATO became more heavily involved in international missions. The original NATO Medal now has 11 older versions and five current versions. Dr. Brian Blodgett is an alumnus of American Military University who graduated in 2000 with a master’s of arts in military studies and a concentration in land warfare. He retired from the U.S. Army in 2006 as a Chief Warrant Officer after serving over 20 years, first as an infantryman and then as an intelligence analyst. Dr. Blodgett has been a part-time faculty member, a full-time faculty member and a program director. He is currently a full-time faculty member in the School of Security and Global Studies and teaches homeland security and security management courses. He is the only known U.S. servicemember to serve at NATO’s Headquarters of their first two deployments: the Implementation Force (IFOR) in Sarajevo, Bosnia-Herzegovina in 1995 and in Kosovo Force (KFOR) in Pristina, Kosovo in 1999.